2/8/19 Dear Parents/Guardians, January and February have proven to be difficult months in terms of weather. We also used an emergency day in September, due to a water main break. Due to these difficult conditions we have lost 13 days of attendance to date. The district had 5 emergency days built into the original calendar and those have been used. As a result, the last day of . . .
Did you receive a call from 217-357-3922? 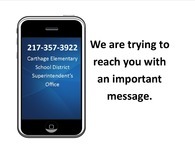 Important Message regarding School Messenger calls The Carthage Elementary School District utilizes School Messenger to notify parents/guardians and students with important information, such as school closings, practice cancellations, early dismissals, lunch balances, etc. In order to make this system work as efficiently as possible, we ask that you please follow the guidelines below: The call . . .